Need to get started with Blender ? Blender docu is in Blender’s Help section. 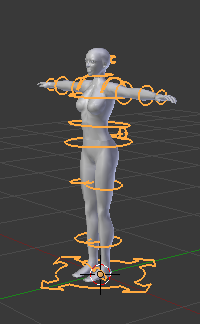 Whenever you create a new Avastar character, the Blender default Material (light grey, with white specularity) is assigned to all of the created Objects. Thus the character is seen with a light grey surface. And you can assign your own materials to your character at any time later. 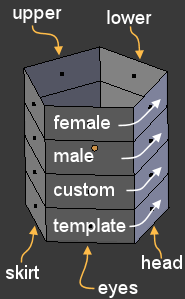 In the Avatar Materials panel you can technically select from 4 material presets, “Female”, “Male”, “Custom”, and “Template”. When you select a preset, then Blender will create a set of 5 materials for you: These Materials are for “eyes”, “head & lashes”, “upper body”, “lower body” and “skirt”. But Avastar does one more thing: It first checks if the materials have already been created. In that case it will NOT(!) add new materials but simple reuse the already existing materials. Thus materials can be setup once and then later reused for all your Avastar characters. Of course you do not need to use the presets for your work. You always can select your very own conventions and your very own materials. The preset selector only helps you to quickly setup a material set. Currently all material sets use copies of blender’s default Material. So without any further preparations Avastar will only create material placeholders for you. Thus even when you select a Material set, your character does not look different from the default. You still need to setup the materials by yourself. But the good news is: You can setup your material sets beforehand. As long as you take care of the name conventions (see above) Avastar will recognize your materials and reuse them. This is why Avastar first checks if a material does already exist! Then i create 4 times 5 materials using the Avastar name convention. I assign each material to a different face of my placeholder object. Now whenever i create a new Avastar and switch between the different Material presets, then Avastar will recognize that the materials already exist and reuse them from my placeholder object. But that is a pain! Yes it is a pain. But isn’t it more pain to set up your characters every time when you create a new Avastar character ? If you want your characters to be skinned, then you will end up with some sort of prepared skin sets anyways. Avastar supports that for now.